In Rowers you are capable of setting up integrations with Garmin, Polar and Suunto. Once you’ve set up the connect you are able to choose how you want your data to be imported into Rowers. You will see there are apps that we have integrated into Rowers. 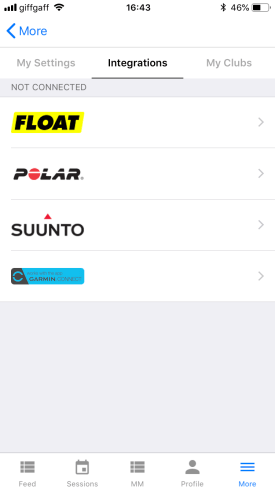 There are automatted imports for Garmin, Polar and Suunto. Please note for Garmin there are two different integrations. Connect to the Garmin Connect logo for automated imports. 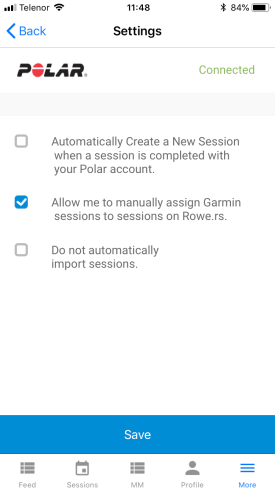 This setting means that any new session that you create on Garmin, Polar or Suunto will automatically create a session in Rowers without you having to do anything. If you have multiple clubs in Rowers you can choose which club you would like your data to be imported to. This setting means you are able to choose from the feed/dashboard what you’d like to do with the import. You can choose to assign it to an exsiting session or create a new session from the import. If you are a member of a club and you have a coach writing a training program for you this is the perfect setting to then assign the import to the right session. When assigning you import to a session you will see a button on the feed/dashboard “Assign to Session”. Press “Assign to exsiting Session”, this will open up a page where you can pick the session you’d like to import the import to. A list of your existing session will appear. Select the session you’d like to import the file to. Once the session is selected you can rate the session from 1 – 10 by pressing the stars. Pressing the Assign to Session will add your GPS and/or HR to the session. A list of your existing session will appear. Select the session you’d like to import the file to. In this case we’ve selected a water session.If a crew already exists you will be given a list of your crews for which you can import the GPS to. Importing GPS to crews will give you a Gold Medal Time (GMT) for the session. The selected session above doesn’t have a crew created. With crews we are able to create a GMT breakdown of your training in every boat type. When you select Create New Crew you will be taken to a simple page to create the crew. Select the boat type, crew gender, crew level and crew weight. The create button will create the crew for the session and assign your GPS and/or HR to the session. When creating a new session from an import we take some of the details from the session to make it quicker. On the feed or dashboard select the create new session button. This will open a new view showing you details of the import you are about to import. When creating a new session you can add a name to session, select the session type and say how hard you found the session.We will try to automatically set the session type to the same as the import however sometimes we are unable able. Pressing Create New Session will create the session and you’ll automatically be redirected to the new session. Pressing Create New Crew will take you to a view to create a crew for the session. Select the boat type, crew gender, crew level and crew weight. The create button will create the crew for the session and assign your GPS and/or HR to the session.Pressing Skip will not create a crew on the session.Pressing Create will create a crew on the session. Once you have imported your data to the session you are able to see the following details on the session.